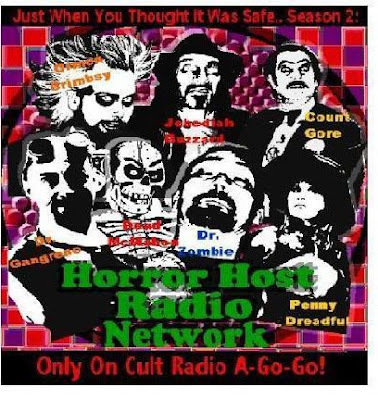 Just found out Cult Radio a Go GO is now playing a second repeat of the horror host block tonight/tomorrow morning - if you're a night owl, here's your chance to catch the fun! My show will therefore will be the first in that block! the 75th anniversary of the original movie. WOW!! GREAT Lineup. Click this art to enlarge and check out the details. This time around I'm posting another of the comic books I had as a kid. This is a rather interesting one, as I have three copies of it! The reason for the multiple copies is that I got them free at the circus. Every year the Barnum and Bailey circus would come to town, and sometimes they would hand out packets of comic books wrapped in plastic. If memory serves me - and this is close to thirty years ago now, so it's a bit hazy - these came wrapped in plastic three to a pack and they handed them to you at the door as you entered. There are three stories here, and there are two hosts for this book. Neither introduces themselves, which is odd, they just introduce the stories. The first host is a blue skinned man with dark circles around his eyes and a purple jacket. We see him at the beginning and end of the first story. The next is a woman with long red hair. She's the same woman who appears on the cover in a circle next to the Charlton logo. Again, no clue who these nameless hosts are. Guess it isn't important. The book is even weirder as a circus freebie as all the stories involve Satanism or Satan himself. The most noteworthy name in the book is Mike Zeck, who draws the best and final story in the comic, Hades University. I always liked Zeck's work in Marvel superhero books, particularly Spiderman, and he's clearly the most talented of the bunch in this book, too. Good ole Charlton comics - you gotta love em. They all have that same flat coloring on cheap newsprint. But they're fun to read nonetheless. Overall this ain't a great comic at all, and really not even a very good one, to be honest. The cover art is merely a blow up of a frame from the Zeck story! But it has memories for me and hey, I have three copies, so I guess I'm covered in case something happens to one of them, right!? The reason for the new layout here is that with the layout I was using I couldn't enable the comments section. I had to go back to a more basic version in order to get the comments link to show at the bottom of the posts. I thought I'd try adding that feature for awhile, as some of the comments people have emailed me have been pretty interesting. Plus I always enjoy looking at the comments on other folks blogs, too, so I thought I'd give it a whirl. So if you ghouls and gals see something interesting, feel free to comment away - now you can! One of my summer interns decided to go into practice for herself - you see where it got her! THIS is one I WISH I had - hilarious cover! Love it! Here's another of the comics I had as a kid. It's a DC book from 1973. This one has stories reprinted from an earlier series of the same name. All the art is by Joe Simon and Jack Kirby. The cover is a real knockout! The stories are interesting in that they're a bit tamer than EC comics, and tend toward less gore and in some cases less supernatural and more naturally explained story lines. 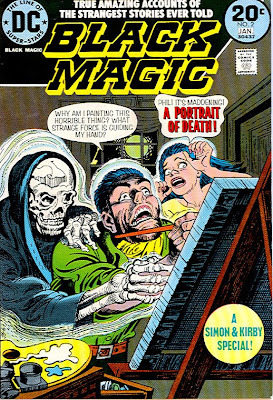 Such as the 3 pager "BIRTH AFTER DEATH" in this issue. The tag line says "The incredible true story of a man who was born five years after his mother died...", yet the twist is she was buried alive and awoke when grave robbers opened her coffin. Black Magic is the name of a fifty-issue horror anthology comic book series published by Prize Comics from 1950-1961. Its numbering continued for three more issues as the humor comic, Cool Cat. DC Comics published a nine-issue series reprinting material from the earlier series by Joe Simon and Jack Kirby. 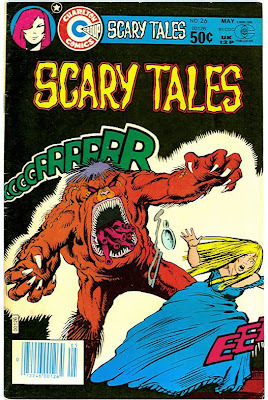 The new incarnation featured new covers with the same logo as the earlier issues of the Prize series and ran from 1973-1975. 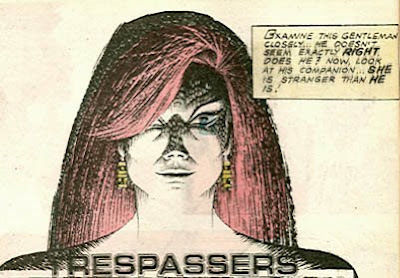 The reprint issues generally grouped the stories by theme; for example, all the stories in issue #1 dealt with intolerance toward human oddities, while all the stories in #4 were about death. It's been awhile since I posted here, and I realize I'm waaay overdue. I don't know why, but I've just had little energy toward blogging over the past couple months. I found Tim Lucas' (Video Watchblog) recent blog on his own struggles with blogging to be very interesting. For me the bottom line is it takes time and energy, two things I just don't always have a lot of. I've had an idea for this blog that I wanted to try but was going to wait until closer to Halloween to unveil. I thought I'd go ahead and do so here on Memorial day, however, as I just simply don't want to wait that long. I still will post updates on my show and what we're doing as newsworthy events come along, but this is something I'll find easier to update regularly. 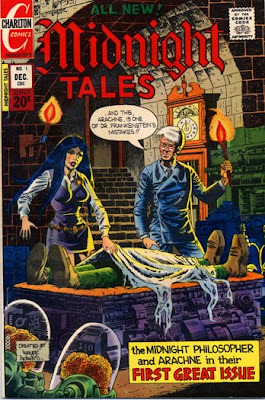 What I plan to do is post a cover from a vintage horror comic each post. 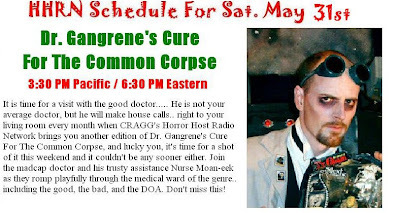 Now, you might ask what does this has to do with Dr. Gangrene? Well, more than you might think. Before I started hosting movies as the southern fried mad medico of Shackle Island, I was writing and drawing comics. Comic books were one of my first loves as a kid, and they really had more of an influence on me than any other media. I LOVED the horror comics, and still do, really. 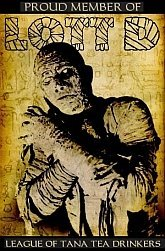 They influenced me more than Famous Monsters, or Fangoria, or any TV hosts. They were it for me. 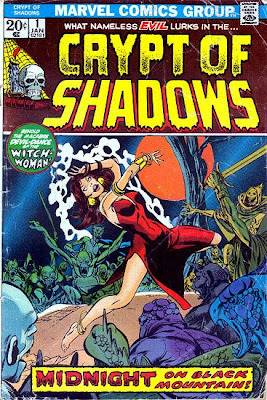 Crypt of Shadows was a Marvel comic from 1973. It was one of the many EC inspired horror anthologies, but it didn't have a host. This debut issue featured four short stories. All of these were reprints from older horror anthologies... apparently Marvel had the publishing rights to art from Hercules publishing company and Atlas Magazine inc. material, and repackaged it as Crypt of Shadows. All I knew as a kid was that these were horror stories, and they were on the rack in my Seven Eleven! I used to cut grass in the summers and save up my money, and would walk up to the local Seven Eleven store and spend it all on candy and comic books. Ah, those were the days! I loved the big giant sweet tarts and coke flavored icees best of all, and grabbed all the comics I could afford. 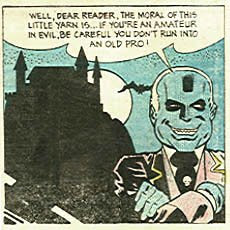 I remember cutting seven yards one summer, mostly on the weekends, just so I'd have money to buy more comic books. AND best of all, I still have most of them. Including this one. The artists in this one are Mort Lawrence, Basil Wolverton, Jay Scott Pike, and Russ Heath. 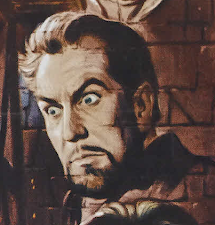 Of them all, I especially like the Russ Heath story, The Scarecrow. It's about a skinny weakling man who finds a unique way to get the body he always wanted... but of course there is a price. If you're interested in reading this comic online, the folks at BD comics online have posted this one in it's entirety. Download it and check it out, to see this creepy goodness for yourself.